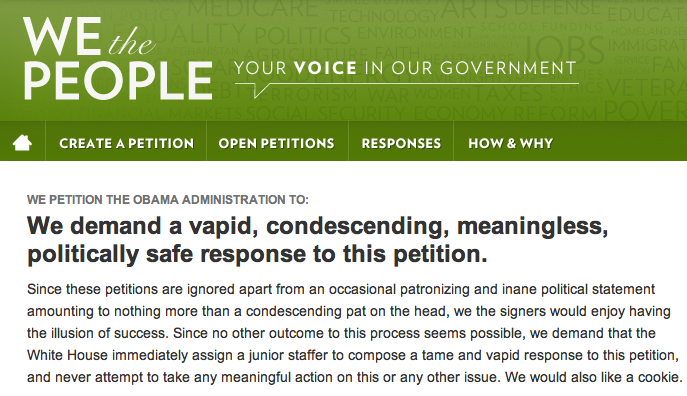 Best petition to Obama ever? We The People is a section of the White House’s website that allows anyone to raise an issue that they’d like the US government to take action on. Of course, whether anything meaningful actually comes of the petitions is another question. “Since these petitions are ignored apart from an occasional patronizing and inane political statement amounting to nothing more than a condescending pat on the head, we the signers would enjoy having the illusion of success. Whether such a response, or indeed the cookie, will be forthcoming remains to be seen, but with 3,616 e-signatures, it’s still a long way from its goal of 25,000 by 4 December. Still, kudos for taking satire right to the President’s front door. Meanwhile, as a response to a recent petition, The White House revealed that it’s still looking for little green men, despite “no credible information” about aliens or a conspiracy to keep them secret.